The now fully reformed suite of A-Level subjects will involve students following a two year linear programme with A-Level marks/grades determined at the end of the second year of study. 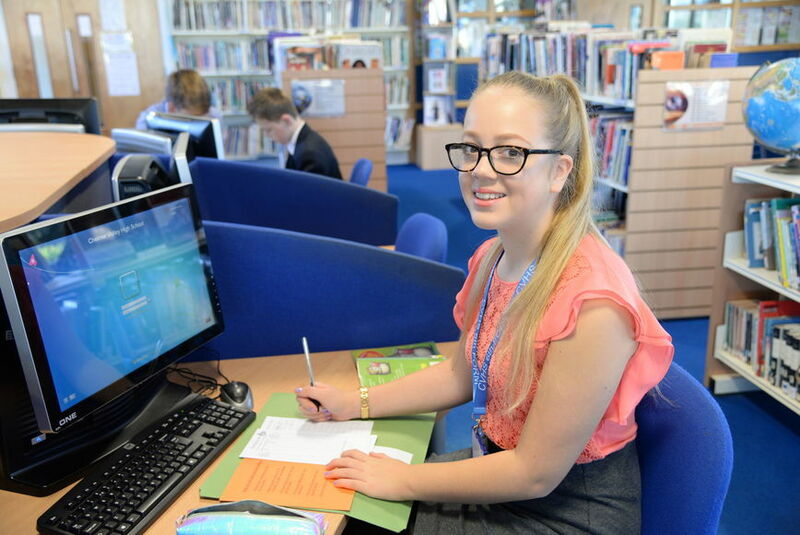 The new AS Level examinations, which are not offered by Chelmer Valley Sixth Form, will not count towards the final marks at A-Level and therefore as a school we have decided to not enter students for these examinations in Year 12 as a general rule. Assessment is now increasingly more exam orientated and although there may be some element of coursework in some subjects, these tend to be for the more vocational subjects. Within each programme of study you are able to choose an individual combination of courses (subject to numbers) that meets your needs, interests and aspirations and offers the best opportunities for success and progression. Final choices are not made until after GCSE results are released, although provisional choices will be considered through guidance discussions with members of the Chelmer Valley High School Senior Team. It is important that you have a good idea of your final choices by the end of the discussion process, as under subscribed subjects will not run. MINIMUM REQUIREMENT FOR OPTION ONE: 56 points from students best 8 GCSEs. MINIMUM REQUIREMENT FOR OPTION TWO: 38 points from 8 best GCSEs, including a grade 4 in English and Maths. GCSE Art and Design grade 5 or above. Grade 4 Art will be accepted on recommendation of the Head of Department. An interest in, and enthusiasm for Art is essential. GCSE Combined Science grade 6-6 or above or GCSE Biology grade 6 or above. GCSE Maths grade 6 or above is required for both options. For A-Level — A previous qualification in Business is not a requirement however if it is studied, then a Grade 6 will be needed. For BTEC Level 3 National Certificate - Minimum Entry Requirement. A previous qualification in Business is not a requirement. You should enjoy independent study & coursework whilst having an interest in the business world. GCSE Combined Science grade 6-6 or above or GCSE Chemistry grade 6. 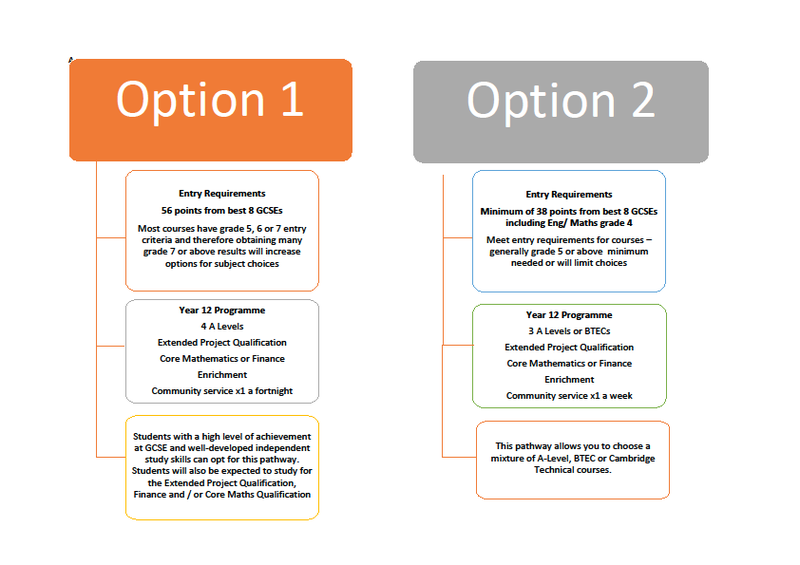 Grade 6 in GCSE Mathematics is required for both options. A previous qualification in the subject is not a requirement, however if it is studied, then GCSE grade 5 or above in Computer Science or Merit for IT will be required. GCSE English grade 4 and Maths grade 5 is also a requirement. If you have not studied ICT /Computer Science at GCSE, then you will need GCSE English grade 5 & GCSE Maths grade 6. GCSE English Language Grade 5 or above. You do not need to have completed Drama GCSE to take this course. You do not need to have studied Economics or Business Studies previously. GCSE grade 6 or above in Engineering or Design Technology plus grade 5 in GCSE Maths, English and Science. GCSE English Literature and English Language at grade 5 or above. GCSE French at grade 6 or above. GCSE Mathematics at grade 8 or 9. Students must also study A Level Mathematics. A grade 5 or above in English Language or Literature. An ability to play a musical instrument or sing to approximately grade 4 standard (GCSE Music not compulsory) The ability to read basic music notation. GCSE Grade 6-6 from two of the following: English Language, English Literature or Religious Studies. GCSE Combined Science grade 7-7 or above or GCSE Physics grade 7 is required Grade 7 in GCSE Mathematics and grade 5 in GCSE English Language is required for both options. GCSE PE at grade 5 or above if you are studying GCSE PE. If you are not studying GCSE PE you will be considered on your GCSE Combined Science grades which must be 5:5 or above or if you are studying triple science a grade 5 in Biology. Additional factors also include; your interest, attitude and attainment in PE throughout your time at school.